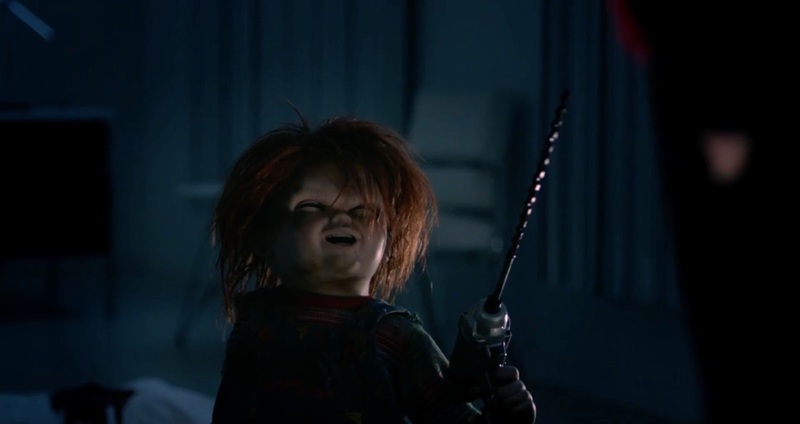 31 Days of Halloween '17 - Day 4 - "Cult of Chucky"
Yesterday saw the release of the latest film in one of my favorite franchises so of course that's what's on the agenda. It's a little sad that Child's Play, a series that has taken a big upturn in quality, is forced to DTV-fare. It's unfortunate given just how much the series deserves a theatrical release to fully take advantage of the horror audience that is chomping at the bit to see their favorite horror icons on the big screen again. After seeing this latest film, maybe staying out of theaters was the right idea. Now this is going to contain some spoilers so make sure you turn back now if you want to go in fresh. Don't get me wrong, it's not a bad movie, but I'm a big fan of the series and it felt like more of a spinoff than an actual entry. At least it tried to remain original, despite some of the twists being spotted from a mile away. I liked that there were multiple Chucky's, although the execution left some to be desired, especially when there were three in one scene. Came off very unnaturally in how Dourif interacts with himself. Maybe it could have been fixed in the mix. It's crazy (no pun intended) that the entire staff fails to react with any severity to the deaths. As soon as someone dies, they just kind of get the body out of there and move on. It got to the point where I wondered if they were doing that on purpose, especially with the nurse up and quitting after one death. But that eventually led to downright nothing at all but a screwy death. The kills were pretty great, if not a little more brutal than I expected. They really went all out and it may be the goriest yet. There was one point where the death was so outrageous that I laughed aloud. There was also a death that made my jaw drop at how beautiful it was. You'll know it when you see it but this contrast was pleasant, if not a tad out of place for a Chucky film. Which kind of sums up this movie as a whole. While it's still a fun movie, and the Chucky bits are great, I wasn't as into the story as I was in Curse. This equated to a much less exciting movie overall but it was still fun. It was especially nice to see the Andy Barclay character back (and clearly set up for a sequel). Overall, it was a fun continuation but nowhere near most of its predecessors.